This role requires English and Mathematics grade A-C GCSE or similar, a desire to challenge yourself, learn and adapt as no two days are the same. A fork lift licence is desirable although training will be provided. If you are keen to use your machining skills but in a unique environment, have excellent analytical, interpersonal and priority management skills with great attention to detail then please apply for this opportunity to develop personally and technically. 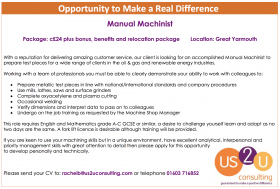 Please send your CV to: rachelb@us2uconsulting.com or telephone 01603 716852. We are pleased to publish our first E-news of 2019! 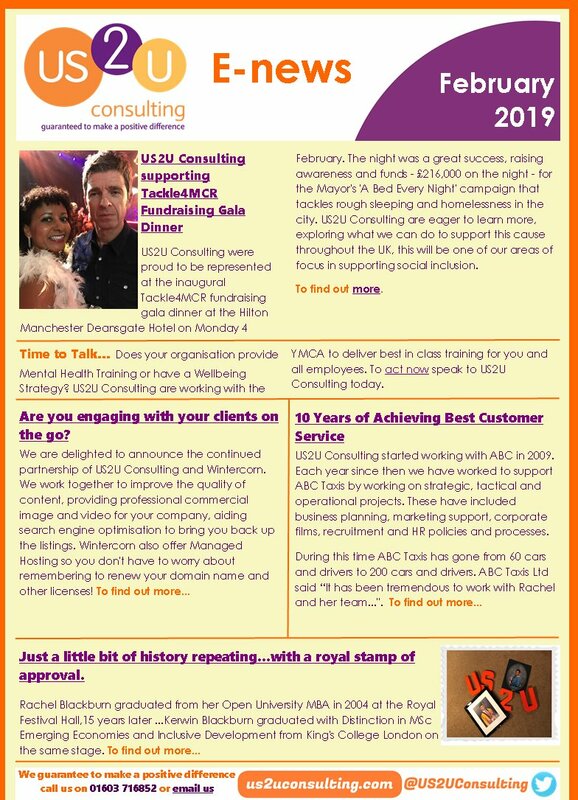 This month features news of US2U Consulting attending Tackle 4 MCR's Fundraising Gala Dinner featuring Noel Gallagher, reflections on working with ABC Taxis and Wintercorn over the last few years, our latest service launched with YMCA, and graduation news from London! US2U Consulting are pleased to share our last E-news of 2018. This month's edition includes news of the Nelson's Journey Anniversary Ball, Rachel Blackburn's visit to 10 Downing Street, a new addition to the US2U Consulting team and more! US2U Consulting have enjoyed working with fresh produce company Worldwide Fruit Ltd over the years, in a partnership dating back to 2005! Our journey during this time - which has seen us work with the company help them evolve as a vibrant, dynamic business - was celebrated in the Summer 2018 edition of Worldwide Fruit's company magazine, The Core. Read the full article, written by Rachel Blackburn, in the online version of Worldwide Fruit's The Core Summer 2018, below! We look forward to continuing our work with Worldwide Fruit in the future! US2U Consulting have been featured in the latest issue of Wind Energy Network magazine! 360 Degree Feedback incorporates insights from an individual's line manager, peers and direct reports to produce a holistic evaluation of their performance. The findings can be invaluable in helping to drive improved individual, team and business morale and performance. To find out how 360 Degree Feedback can benefit your organisation, contact rachelb@us2uconsulting.com.